Maybe you're running an ageing Wireless-G network or perhaps you've got Gigabit onboard, but are wondering if it's worth investing in a new switch or router to take full advantage of it? Perhaps you're eyeing up powerline as an alternative but don't know how well it'll perform? Or perhaps you're wondering if Wireless-N is right for you? What are the options for those planning on extending, upgrading or building a network? Wired networks are still the world's favourite method of communicating between PCs . Ethernet networks have been around for decades, they're robust, reliable, easy to work with, standardised, extendable, cheap and fast. Those are all words we like. It's so ubiquitous that every motherboard produced will have a port integrated on it, this from a industry that attempts to shave every penny from production costs. The same goes for laptops, so when your standard shipped products offer it effectively for free it's something you have to consider. Particularly when 30m cables costs as little as £7 and that's long enough to reach any corner of most houses. The beauty of Ethernet is that it's fast and reliable, largely as it has been around for so long. All equipment should be at least 100BaseT compliant, the older and slower 10BaseT was supersede by 'Fast Ethernet' in the mid-1990s. The even faster Gigabit 1000BaseT standard has been widely integrated as standard since 2004 with it being an option since the early 2000s. In speed terms theoretically a 100BaseT network offers 12.5MB/s of bandwidth, take into account TCP and the Ethernet protocol requirements and in practice file transfers tend to hover around 11MB/s. Gigabit offers the potential of 125MB/s transfers, though the real-world performance can fall far short of this for a number of reasons, but if you're the sort who likes to throw large files around then any reduction in transfer times is a good thing. We say far short, as the largest bottleneck will be the hard drives. For our testing this will be an irrelevance, but in the real world this can limit the potential maximum to 20, 40 or at best around 60MB/s for fast up-to-date drives. Our test circumvents this issue and tests the raw throughput, in this instance of the Sitecom 300N-XR. We were pleased with the 101MB/s peaks and average transfer of 95MB/s with an average CPU usage of 36 per cent. The final issue if you want to rollout Gigabit in your home is that you have to have an end-to-end solution. It's no good connecting your Gigabit laptop to a 100BaseT router and than that to your Gigabit capable home server. There's little to no options for infrastructure upgrades at the moment, it seems all ADSL/Cable routers still only offer 100BaseT ports. 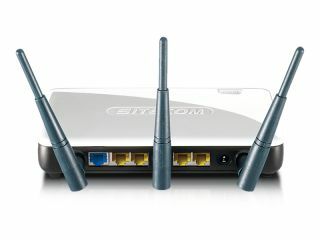 You either need to invest in a Gigabit switch – five-port ones can be picked up for around £30 such as the Netgear GS605 – or opt for a suitable wireless router that happens to sport a Gigabit router, such as the Sitecom 300N-XR Gigabit Wireless router for around £90. One final mysterious area we want to clear up is the type of cables you need to use to enjoy Gigabit speeds. Simply put: even CAT5 will work as well as CAT5e or even CAT6. Technically yes, CAT5e and CAT6 are superior but generally the extra expense isn't necessary even over long runs. Just to test this out we re-ran our Gigabit tests with some 15-year-old CAT5 cables that we had lying around. There wasn't a jot of difference to the performance, well, perhaps there was a 5MB/s drop in the minimum recorded speed but the average remained the same. There's no arguing that Gigabit is fast, very fast. But wiring your house up with CAT5e wire isn't the most spouse-friendly activity or indeed house-friendly activity. You can drop cables under floorboards and behind the skirting, but you are going to need Ethernet faceplates at some point or end up tacking them to walls, for a less desirable finish.